With a different feature set and voice, the Si is a solid alternative to the Ge, and it's good to have a choice. Nice lower midrange fuzz sounds. Fat, round character. Doesn't clean up by guitar volume as well. 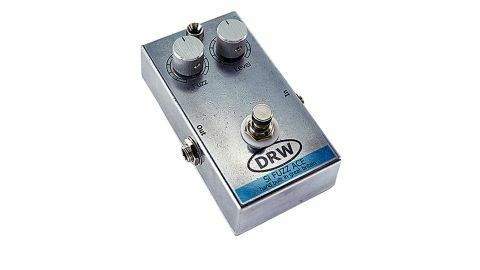 There are three fuzz options in the DRW range. The germanium transistor-based Ge Fuzz, the Ge Fuzz Ace Plus (£129) adds an extra transistor to the design with the aim of creating a more intense fuzz, delivered via just two front-panel knobs: level and the aptly-named crank. "This is the Fuzz Face revisited, based around a set of NPN Silicon transistors"
Then there's this Si Fuzz Ace, again with two knobs: fuzz and level. This is the Fuzz Face revisited, based around a set of NPN Silicon transistors (that DRW believes are unused in this type of design), meaning that it's possible to run the pedal from a standard 9V adaptor as well as a battery. The Si's natural sound has a little more in the lower midrange and seems gainier, yielding a fatter and rounded character akin to what you'd get from turning up the Ge's bias and shape knobs. Clean-up by guitar volume doesn't work as well as with the Ge, but for full-on fuzz it's just as great.